Whether you are looking for a custom pair of diamond earrings for a special occasion or some comfortable and elegant earrings for everyday use then The Diamond Jewellery Studio can create exactly what you require. Master Jeweller, Nick Ireland can take your dreams and turn them into a design that is as individual as you are. With years of experience and hundreds of satisfied customers you can join Nick for a consultation at his CBD offices in Melbourne and Sydney or his Studio in Brisbane to start the process of creating your bespoke diamond earrings. We have a stunning collection of Australian South Sea and Tahitian Pearl diamond earrings including stud and drop earrings which can be made to suit both pierced and non pierced ears. There are so many different styles of diamond earrings Brisbane Master Jeweller, Nick Ireland can design for you including simple and elegant studs, eye catching drop and dangle earrings and classic hoop styles that let you create something for any occasion. Nick can take the style you want and enhance it by adding sparkling diamonds, precious gems or luminous pearls to produce a look that you will be amazed by. He can also help you to decide on the best precious metal to choose with rose, white and traditional gold or platinum available or the option of combining metals for a truly stunning design. You can view some of The Diamond Jewellery Studio’s stunning earrings on this page. They show the amazing detail that comes from hand crafted jewellery and the fabulous synergy of having a Master Jeweller combine a visionary design with the best materials to produce something that is greater than each individual part. One of the advantages of working with Nick is his extensive stock of high quality diamonds and the ability to source directly from the major diamond bourses around the world. This ensures that you never have to compromise and that you have the widest choice of overseas and Australian sourced diamonds. Nick can even create an all Australian masterpiece with diamonds and gold produced in Australia for a truly unique pair of diamond earrings. 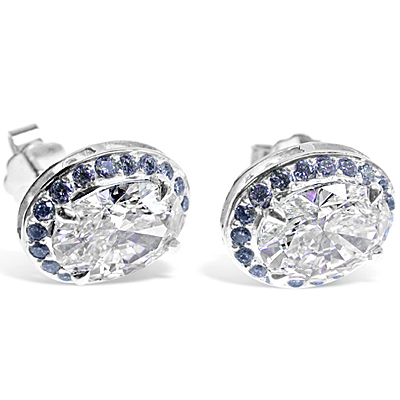 If you are looking for the best quality and best value for money, hand-crafted diamond earrings Brisbane Jeweller Nick Ireland should be your first choice. Contact him today and start the process of creating your perfect earrings now!